VirtualGiff's Back to School Top 7 Google Tips - Day 5 - The Starred Folder! Earlier this week, I decided to share one of my favourite tips every day for the seven days leading up to the new school year. (See the full blog post here) Here we go for day 5…. I want to be able to find items quickly in My Google Drive. In your drive you might notice a little outline of a star beside file names. When you click the star (or right click the file name and select “Add Star”) it adds that file to the Starred folder. Earlier this week, I decided to share one of my favourite tips every day for the seven days leading up to the new school year. (See the full blog post here) Here we go for day 3…. 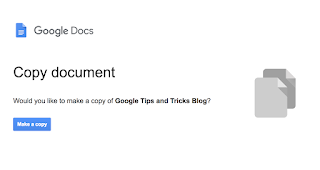 I want to have someone to make a copy of a document into their Google Drive! The more polite way (IMHO) is to change /edit to /template/preview (just like above). I like this way better because instead of the blank screen just asking users to make a copy (of something they cannot see) it allows them to see the file they are making AND keep them name (no more “Copy of…”). To make the copy to their drive they just need to click the blue Use Template button at the top right. Both of these work for Docs, Sheets, Slides, Drawings, basically any of the Google Core Suite tools. Earlier this week, I decided to share one of my favourite tips every day for the seven days leading up to the new school year. (See the full blog post here) Here we go for day 2…. Can I stop accidentally closing tabs? Simply right click a tab in chrome and select Pin Tab. 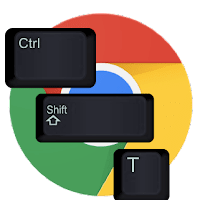 This will make your big tab shrink and move it to the far left. Now the red x you press to close the tab is gone and in order ot close it you need to right click the small tab and select Close Tab. I am on my way to Thunder Bay (literally, I am writing this post on the airplane) to the EdTechTeam summit for the KOBE. I am excited to be delivering one of my favourite session “Google Tips and Tricks”. I built it almost 2 years ago when I was asked to do some work with new teachers who had experience with Google but were looking to “level up” a little. I love this session. The slide deck shares over 50 tips and tricks with all sorts of Google tools (Docs, Drive, Slide, Classroom, etc.) I update it whenever I learn something new. I realised that some of these tips would make a great blog post and so - with the goal of blogging more (ideally once a week) this school year - I figure this would be a good start. So in the 7 days leading up to back to school...I am going to share one of my favourite tips every day! Here we go…. Help! I closed a tab in Chrome by accident! Simply press CTRL+ SHIFT+ T and it will open the last tabe you closed. Continue to press CTRL+ SHIFT+ T and you will open the second last tab that was closed...and so on and so forth.